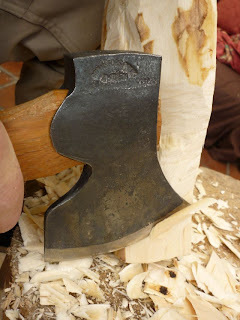 I recently got in touch with Sean Hellman and asked if he wouldn't mind selling me one of his fine Granfors Brucks carving axes. I have been interested in this axe for quite some time now. Sean seemed quite keen on the idea and drove up to my home one Sunday afternoon. Sean and I had a great time swapping yarns about this that and the other, and he duly demonstrated the axe over a cup or two of coffee. It didn't take long for me to see that this might be a good addition to my arsenal. This axe is in no way a bushcraft tool. I have bought it purely for spoon and kuksa carving. 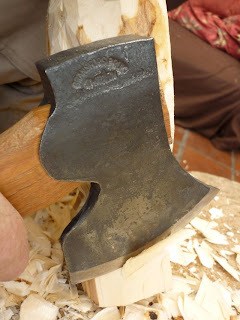 I wanted an axe with a slightly heavier head that would be suitable for splitting out waste wood as well as finer carving, a faster axe in fact. 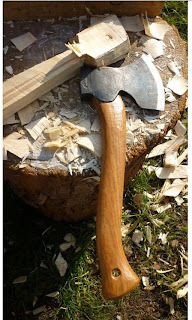 A chop axe for hewing bowls and other wooden objects, artistic wood carving and architectural work. 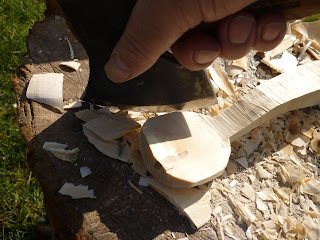 The characteristic curved shape of the cutting edge, carried well above the head's eye, the position of the edge in proportion to he handle, the rather thick bit and the big angle of the wide beveled face makes this axe a good carving tool. You "cut on the beveled face" with curved movements. This new axe pattern, based on old Swedish carving techniques, was developed by Wille Sundqvist, master craftsman and author of "Swedish Carving Techniques" in cooperation with craftsman adviser Onni Linnanheimo. The handle is "rugged" to give a good grip. Now I've had a good old play with it, I think I can explain why the toe of the axe is higher than the eye. 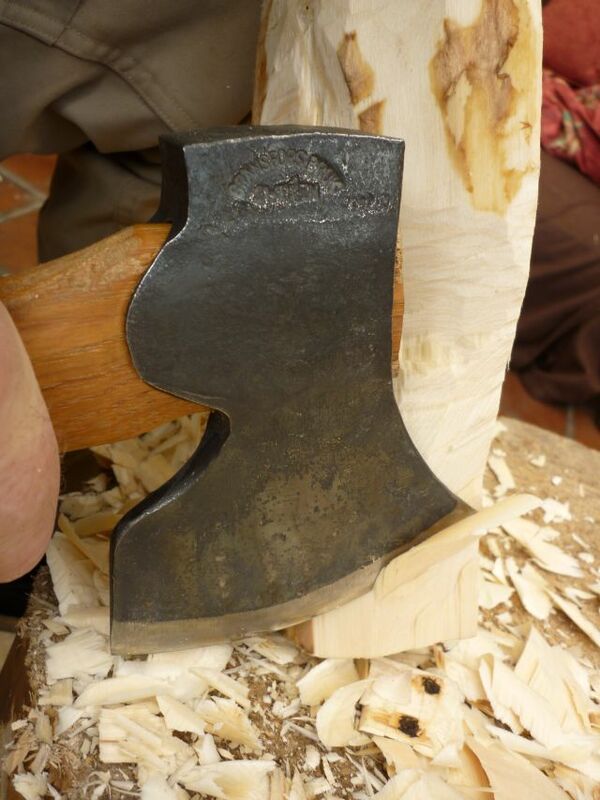 It's all to do with being able to turn the axe out of a cut. 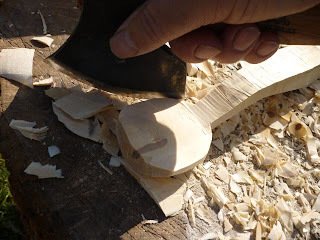 You may wish to do this when cutting out the back of a curved spoon handle or the neck of a goose or kuksa. 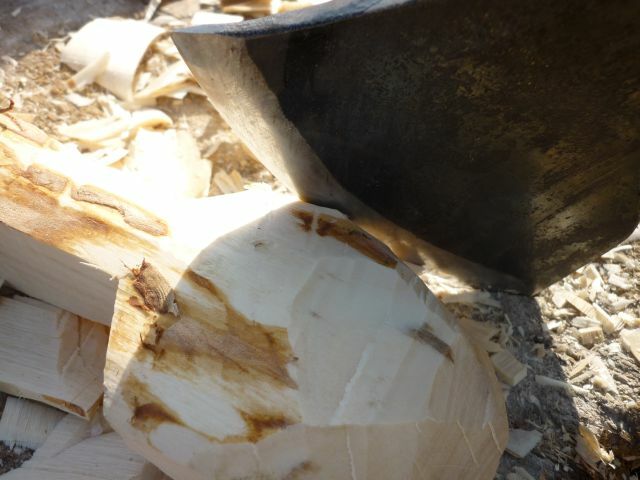 Here is a photo of me cutting the back of a kuksa using the middle of the cutting edge. As you can see, if I wanted to turn out of this cut, the poll of the head would foul the work piece. 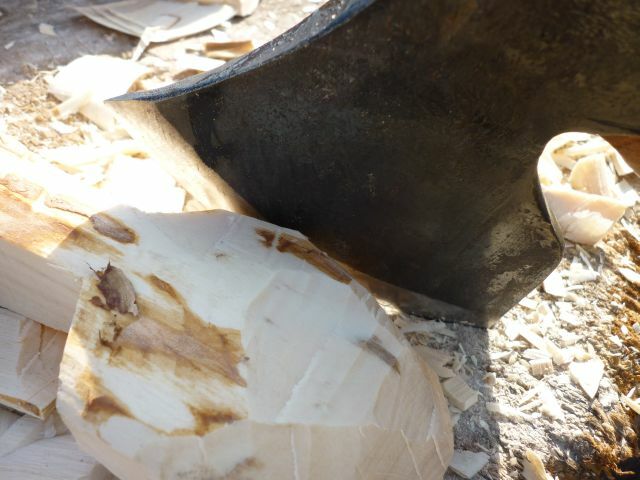 However, if I cut using the fine toe of the axe I can turn the cutting edge out without fouling the poll against the work. You can see that I can swing the head past the work, this enables me to slice finer curves than I would be able too with a Standard axe head shape. 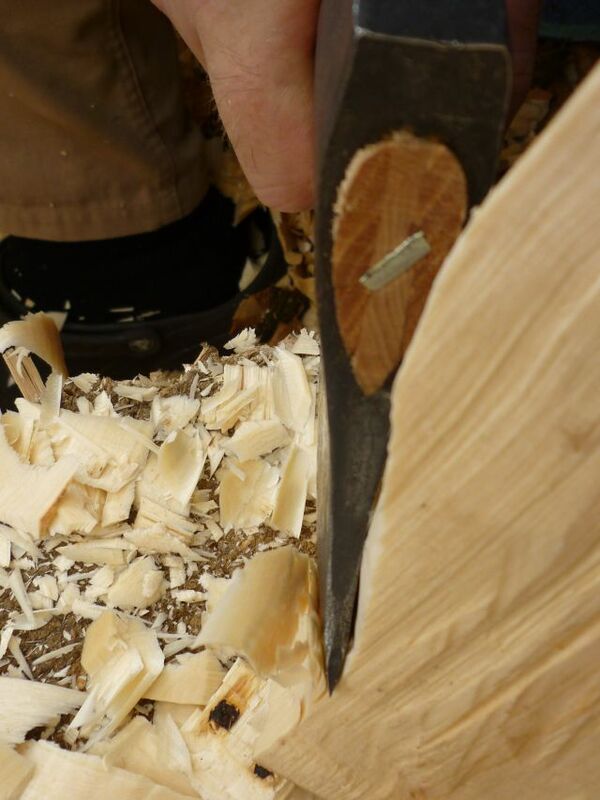 I also like the way I can cut using a rocking motion, much like a clog knife. And I can use the heel of the bit in the same fashion. All in all I am thoroughly enjoying my new addition and I would highly recommend giving Sean a call. That is a great axe. I've been using one since December and it has turned into a great multi tool. I agree about the Roselli. Can't replace it. But with both axes, there are a lot of new possibilities. Is it one of the asymetrical grinds or the double sided ground that you have? Its a little hard to tell from the photos.